The weakest link of most classic trucks is the brake system. 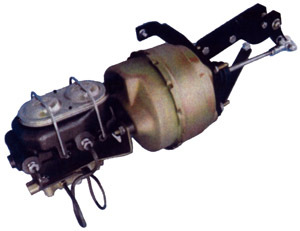 Even correctly restored brake systems from 40’s to 60’s trucks can be poor performers by today’s standards. Luckily, upgrading is fairly easy. First lose the single reservoir master cylinder if your truck is equipped with one. CPP makes a Corvette style master cylinder and power brake booster set-up that fits under the floor on 48-52 and 53-56 Fords as well as versions to fit Chevy and GMC trucks. The CPP units can be configured for any disc/drum brake set-up. You can also use them on auto trans or stick shift set-ups. If you’re keeping your clutch pedal, you’ll need an additional kit when you purchase the booster kit.